The Vegetarian Ketogenic Diet is becoming more and more widely used and with it comes the demand of meat-free meals. 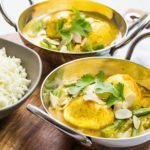 A great Keto Vegetarian dish is our Low Carb Indian Boiled Egg Curry. Place a medium size saucepan over medium heat. Add 2 tablespoons of the ghee to the saucepan. Add the onion, garlic and chilli and sauté until the onion begins to look translucent. Turn the heat down to low and add the turmeric, garam masala, ginger, coriander and cumin. Gently cook until fragrant, around 5 minutes. Add the tomato puree, salt and pepper and cook for another 2 minutes. Add the coconut cream and bring the curry up to a simmer. Simmer for 10 minutes. While the curry sauce is simmering place the remaining 1 tablespoon of ghee into a frying pan over medium heat. When the ghee is hot add the boiled eggs and gently fry until the outside are brown and crisp. This will help the curry sauce to stick to the normally slippery egg white. Add the crispy boiled eggs to the curry sauce along with the green beans and simmer for 5-8 minutes. Serve the curry over Low Carb Cauliflower Rice, garnished with the chopped cilantro and flaked almonds.